Kodak used two sensors in its EasyShare V570 to enable its ultrawide second lens. Olympus puts a second sensor to better use with its Evolt E-330: to provide its digital SLR with a live preview, just like those in standard snapshot cameras. 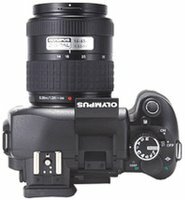 Though the LCD certainly can't replace the viewfinder for most shooting, it turns out to be quite useful to have around. Aside from that innovation, the 7.5-megapixel E-330 is a decent, feature-packed, solidly built model, albeit with a few flaws. Opting for Olympus's f/2.8-to-f/3.5 14mm-to-54mm (28mm-to-108mm equivalent) lens rather than the f/3.5-to-f/5.6 14mm-to-45mm (28mm-to-90mm equivalent) that ships with the kit version makes this a more expensive--but ultimately more rewarding one--proposition. The Olympus Evolt E-330's body duplicates that of its predecessor, the E-300, with a slightly more compact version of the same solid, tanklike design and construction. It's not the most stylish dSLR I've seen--and at 1 pound, 6 ounces, hardly the lightest--but I'm not recommending it as a fashion accessory. From a strictly functional viewpoint, everything is where it should be; all the controls, buttons, and dials fall beneath the thumbs and the right forefinger, without requiring contortions. A rubberized grip covers the right flank of its plastic-and-aluminum body, providing a comfortable hold that afforded me relatively stable one-handed shooting at times. The controls follow the layout we typically see in dSLRs. A variety of direct controls populate the back of the camera, including an autofocus/autoexposure lock button, and also controls for metering mode selection, white balance, ISO sensitivity, continuous-shooting modes, and the self-timer. The OK button brings up an onscreen control panel for adjusting multiple settings in a single view, including the aforementioned functions as well as flash compensation, color-space selection, and compression/resolution combination choices. Olympus gives you a choice between an LCD preview generated via a CCD in the optical path (Live View A) or a mirror lockup mode in which the LCD shows exactly what's on the NMOS capture sensor (Live View B). 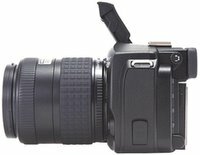 A minor quibble: Olympus outfits the viewfinder with a big, comfy eyecup, though I frequently found my right cheek left prints on the LCD. More significant, Olympus wastes the opportunity to provide explanations within the menu interface. Though the scene modes have a bit of text to explain their functions, it would have been even more useful for the hard-core menu settings, such as the baffling Gradation, with its High Key and Low Key options (this shifts the tonal range to compensate for extremely bright or dim subjects). Olympus manages to pack both sophisticated and novice-level capabilities into the Evolt E-330; from a feature perspective, it really strikes me as a great tool for learning photography. For beginners, it offers a boatload of scene modes, including less common ones such as Underwater Wide and Macro, Sunset, and High/Low Key. In fact, because of the LCD preview, you can use the Olympus Evolt E-330 just like an overgrown--and overpriced--point-and-shoot model with interchangeable lenses. Midrange shooters have all the manual controls expected on a dSLR: shutter speeds between 8 minutes and 1/4,000 second; ISO speeds ranging from 100 to 1,600; exposure compensation to plus or minus five stops; three types of 2 percent spot, center-weighted, and evaluative (Olympus's Digital ESP) metering schemes; three-point autofocus; and automatic and manual settings for white balance, as well as seven presets. Finally, Olympus provides the kind of depth on these features that more advanced photographers crave. For example, simultaneous raw-plus-JPEG capture; the ability to fine-tune and save contrast, sharpness, saturation, and white-balance bias settings; five types of bracketing, including focus and flash; depth-of-field preview; shading compensation, which can offset vignetting (darkening) around the edges of a lens; and an antishock mode, which increases the interval between shutter release and mirror movement to minimize camera shake during long exposures. Of course, there's also a variety of options surrounding the LCD Live View operation. There are two Live View modes: one that operates much like a standard snapshot camera and directs you to close the built-in viewfinder cover (to prevent light leakage), and a second that locks up the mirror to prevent camera shake. Live View Boost makes the LCD easier to see in dim light by providing a grainy black-and-white display. You can also turn it all off and use the viewfinder. One interesting note about the Live View is that I didn't use it in the manner that I expected. I had envisioned it as a way to get an accurate preview of scene exposure since my most common need for reshooting stems from incorrect or unsatisfactory exposure. Unfortunately, it simply doesn't work for that. For instance, scenes that looked correctly exposed on the LCD were so underexposed that they looked black. 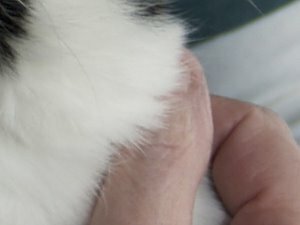 However, I found myself using the display's tilting capability to experiment with odd angles I simply couldn't see with a viewfinder, as well as for casual shots, such as the information cards on cages at an animal shelter where I was photographing the animals, where quality didn't matter. Although I'd hardly call the Olympus Evolt E-330's performance subpar, taken as a whole, it is the weaker aspect of the system. Shooting performance is acceptable but far from best in class. From power-on to first shot takes about 1.7 seconds--longer than most recent dSLRs but hardly an eternity. This is understandable since the camera has two sensors and an LCD to initialize, unlike other models. Its shutter lag of about 0.5 second in good light nudges up to 0.7 second in dim light. Though it lacks an autofocus-assist lamp, if you pop the flash up, it will strobe enough illumination for the focusing system to get a lock; if you want to shoot with available light, you have to remember to turn the flash off while it's up. 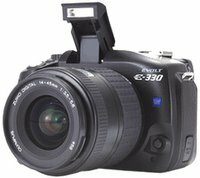 Regardless of file format--JPEG, TIFF, or raw--the E-330 can take single shots 0.8 second apart; using the flash bumps shot-to-shot time up to just 0.9 second. 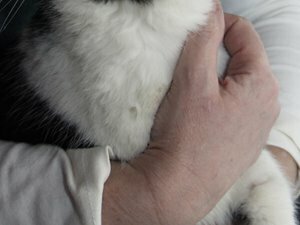 In practice, I found it fast enough to photograph moderately active cats. In continuous-shooting mode, it can maintain a 3fps rate for considerably more than 100 JPEG frames, but that drops to a 4-frame limited 2.1fps for full-size files. 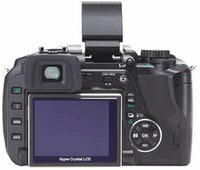 Olympus's HyperCrystal LCD is bright and sufficiently high resolution for judging image sharpness. And thanks to the tilt, viewing in direct sunlight becomes a nonissue. Getting accurate framing may become a bit confusing, though. The viewfinder displays 95 percent of the scene, typical for this class of camera, while the LCD shows only 92 percent. However, if you use the mirror lockup mode, the LCD then shows 100 percent of the scene. Although this makes technical sense--the NMOS capture sensor uses the Four Thirds standard 4:3 aspect ratio while that of the viewfinder CCD is likely different, so somewhere something's bound to get clipped--it's suboptimal from a user standpoint. The Olympus Evolt E-330 that we tested had final firmware but was an early unit--I hope that accounts for one of the more serious glitches I encountered, which concerned either the metering system or the exposure latitude. A few of my photos came out vastly underexposed, far more underexposed than the scene lighting and meter readings warranted. User error, as always, might factor in as well. The kit version of the Olympus Evolt E-330 ships with the Zuiko f/3.5-to-f/5.6 14mm-to-45mm (28mm-to-90mm equivalent) lens. I have to admit, I'm not really fond of it. It's slow (with respect to the maximum aperture) and can't focus closer than 1.2 feet. I much prefer the f/2.8-3.5 14mm-to-54mm (28mm-to-108mm equivalent) lens that I've been shooting with on the E-1. It's more expensive, but I've found that I can get better exposed indoor shots more consistently than with the 14mm-to-45mm lens, it delivers better (shallower) depth-of-field for portraits, and it allows for focusing within inches of the subject. I had real problems getting decent exposures of black cats--always difficult--even with the add-on FL-50 flash unit. In general, the Olympus Evolt E-330 delivered excellent white balance and great skin tones, even with a strong flash. In general, however, the camera maintains a relatively low noise profile across all the ISO settings; noise remains generally unnoticeable up through ISO 400. Overall, our test photos indicate that the E-330's metering system has a tendency to underexpose, which is fine if you shoot raw, but there's not a lot of latitude in the shadows of the JPEG images to bring the exposure up without encountering posterizing or noise. Another surprise to watch for is that the camera ships with the default sharpness set to the minimum. Be that as it may, I managed to shoot some very sharp, detailed images that produced excellent prints as large as 13x19 inches.